Memory is like a firefly. Intermittently bright. Unpredictable. You can't see much with a firefly's glow, and you certainly don't see the bug itself. You see its traces, its path, without any idea where it's going or where it's from. If you can catch it in a jar on a summer night there's the constant threat of suffocation and death. Memory is corruptible. Eye-witness testimony is unreliable. The firefly is under constant threat of disappearing. 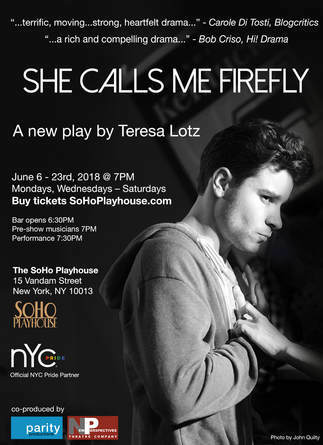 What struck me in the new play She Calls Me Firefly was non-chronological persistence of memories. They arise when we least expect them, and, like fireflies, follow a meandering path with flashes of clarity and vast swaths of darkness. Memories are notoriously untrustworthy, but when we see a character's flashbacks on stage we're taking their word these events really happened. 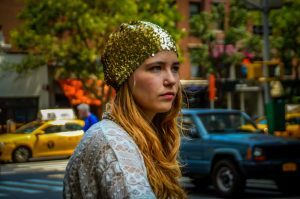 A playwright can develop a character through flashbacks, but we must understand that the flashback is primarily part of the character's current mental state. A flashback is not pure dramaturgical exposition. It's not "X happened, and Y happened as a result." It's still the character's memory, and we can't trust it. In She Calls Me Firefly, Ken stumbles half drunk into a late-night Kentucky dive bar. He's just been through a breakup, and the subtle rainbow flag on the wall indicates this is a rare (and unsurprisingly empty) gay bar in a red state. Ken hears the voice of his mother, young, and he switches into a 6-year old's mindset throughout their conversations. It's unclear whether these flashbacks are being recounted to Freddie, bar's proprietor, or if they're simply taking place in his head. What we do know is that he loved his mother deeply. We also see flashbacks of his relationship with Levi, an artist, who hesitates to call Ken his boyfriend. The playwright explores complex themes of homophobia and childhood trauma, though the audience must bear in mind that these are Ken's memories. The other characters may have their own points of view. I started to wonder if his mother's character was accurate - a "true" depiction - or if the actress merely portrayed the memory of his mother. A child romanticizes. A 6-year old idolizes his mom. For this reason we are left completely flabbergasted when we discover she's touched him inappropriately and perpetuated a family line of child abuse. It's this confluence of romanticized mother-figure and stark reality that hit me in the gut. Ken's childhood memory revolves around languid, joyful summer nights catching fireflies. Yet he's buried the trauma deep and must confront it before his relationship with Levi can blossom. I left wondering how my memories were formed, whether my vision of my mother and father are "accurate." Do they remember me the same as I remember them? Do they remember the night of belly laughter, the teenage fights, the prom photos in the front yard? Where do our memories and reality converge? Put that way, is there such a thing as reality to begin with? I bid on these tickets as part of a bundle at The Tank's annual gala and silent auction. I paid $20 for tickets to The Brick, HorseTrade Theater Co, and this show. Not bad! Silent auctions - Letting you pay less for more in a room full of introverts.